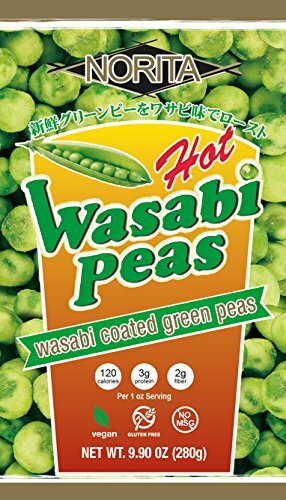 Hot Wasabi Peas. Ingredients: Green pea, corn starch, palm oil, sugar, maltodextrin, hydrolyzed vegetable protein, salt, wasabi powder (horseradish, glucose, maltodextrin, silicon dioxide), FD&C Yellow No 5, FD&C Blue No 1. Allergy Information: Contains soy, FD&C Yellow No 5 Produced in a facility that uses peanuts, seeds, tree nuts and soybeans. Distributed by: Luv Yu Bakery, Inc. Manufacturer: Luv Yu Bakery, Inc. Publisher: Luv Yu Bakery, Inc. Studio: Luv Yu Bakery, Inc. If you have any questions about this product by Norita, contact us by completing and submitting the form below. If you are looking for a specif part number, please include it with your message.